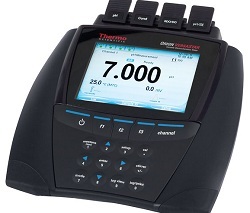 THE NEW Versa Star meter, made by Thermo Scientific and available from Cole-Parmer, offers versatility for multiple uses in advanced electrochemistry metering. Fully modular to be configured as needed, and with up to five parameter modules available, the Thermo Scientific Orion Versa Star meter can take measurements on up to four channels at once. Channels can be customised by selecting from five parameter modules: pH, pH/ISE, conductivity, DO/RDO, and pH with LogR. Measurements are displayed on the large colour graphic LCD with multiple language capabilities: English, French, German, Italian, Spanish, and Chinese. The device has a non-volatile memory holding up to 2000 data points with time and date stamp. Data can be transferred via two USB and RS232 ports. The meter is available with specific modules only, with the module package, or as a full kit containing meter, modules, electrodes, and solutions.